RESIDENTS and organisations stepped out on World Suicide Prevention Day as part of a campaign to eliminate people taking their own lives in Solihull. Councillors, charities and supporters went on walks from The Core to Brueton Park and in Marston Green to raise awareness of suicide. It follows the launch of the Council’s Zero Suicide Pledge. The pledge was launched at The Core by Councillor Karen Grinsell, cabinet member for adult social care and health. It calls on residents and organisations to sign up and make a commitment to look after family, friends and colleagues; become more aware of any concerning changes and ask if they are ok. The pledge has a link to online training and support to help people spot the warning signs in others and signpost them to help. 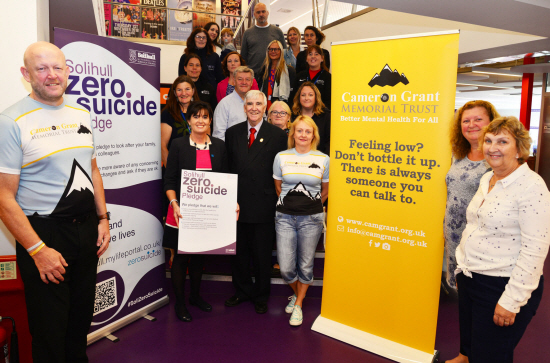 Evan Grant from the Cameron Grant Memorial Trust said: “We are delighted to see Solihull Council make a public commitment to zero suicide. “Our son Cameron took his own life after fighting depression silently for seven years. “Had he known it was ok to talk about suicide we believe he would still be alive. “Please sign the Solihull Zero Suicide Pledge and take the free 20 minute online course from the Zero Suicide Alliance. Natalie Buxbury, who lost her best friend to suicide in November 2015, attended the suicide awareness walk from The Core. She said: “It came out of the blue and up until that point suicide was never really on my radar. “Since then, I have done everything in my power to raise awareness. Councillor Karen Grinsell, cabinet member for adult social care and health said: “As a council, we believe that suicide is preventable which is why we have created our ‘Zero Suicide Pledge’. “Everybody has a role in preventing suicide so I encourage residents and organisations to sign the pledge. “The training will help you recognise the warning signs. Asda in Shirley and Chelmsley Wood have both backed the pledge.